If you have ever mistaken discarded umbrellas on rainy sidewalks for crumpled bats — it happens with wet glasses at times — you will enjoy the “metamorphosen” series of sculptures by Elisabeth Ajtay. Over a four-year period, the artist salvaged these fallen creatures, removed their black nylon membranes, and transformed the twisted skeletons, with loops of wire and other additions, into insectile robots. 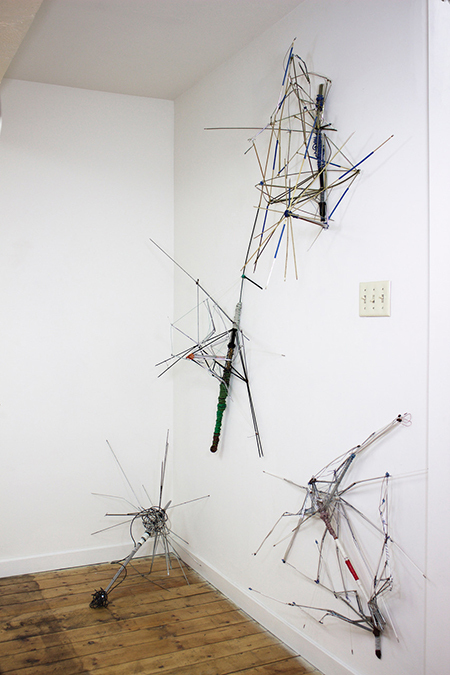 Mosquitos and dragonfly larvae are readily conjured, as well the newly photographed bacteriophage, or spider virus, but these nine strange and witty bricolaged lures, clinging to the gallery walls as if daring to be swatted, have no specific models in art or entomology. Also shown are five inkjet prints of the bots (which, incidentally, have names evoking scientific nomenclature, e.g., “RI-1617-11”), photographed against seamless white backgrounds. Four drawings in tonal reversal, white ink on black backgrounds, evoke photograms, with the silhouetted flattened forms suggesting fossils. A sound installation is entitled “babel,” with the gallery’s stairwell, covered with cloud-like quilt batting, standing in for the mythic tower blasphemously built to reach heaven. Recorded voices repeat, in sixteen languages, including the lingua franca of English, Kant’s categorical imperative: “Act only on that maxim through which you can at the same time will that it should become a universal law,” a philosophical restatement of the reciprocal-altruism Golden Rule embraced, at least nominally, by all religions.